I actually had a preview last year when the book came out, so I'll save some writing by using the earlier content. 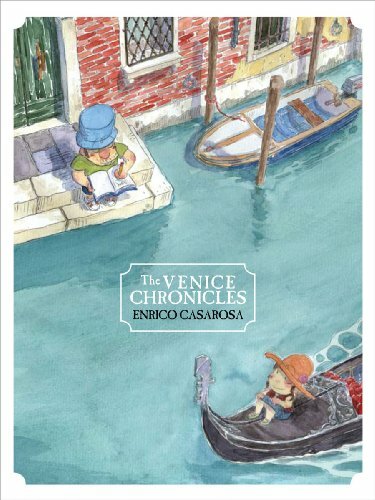 If you love sketchbooks or watercolors or travelogues, you'll love The Venice Chronicles. It's a sketchbook, travelogue, and a comic thrown into a sturdy hardcover book with a sweet love story. Enrico Casarosa is a story artist at Pixar, so storytelling is his forte. The story centres around his travel with his girlfriend in Venice. Included is a section on how they met, and how he used his drawings to attract her attention, of course! There are lots of great interaction and funny dialogue to draw smiles. His whole adventure during the time at Venice is wonderfully captured. The sketches and watercolour are really beautiful and suited for the story he told. The characters are appealing and real. There aren't a lot of watercolour comics around. Venice Chronicles is a nice one. Enrico has created a Flickr set for the book where you can read the pages, best viewed in slideshow mode. The resolution isn't great so you'll still want to buy the book and support the artist. It's a lovely book. My copy was bought at San Diego Comic Con 2009 and signed by him. Also check out the creative process of the book on Enrico's Flickr photoset titled The making of The Venice Chronicles, also best viewed in slideshow mode to you can read the captions. I love the photo of him painting and carrying the baby at the same time — multitasking creative talent.